When you think about Christmas in the USA, you probably picture snowy Central Park or the lighting of the Rockefeller Center Christmas Tree, but they do things a little differently in the desert. The Ethel M Botanical Cactus Garden is home to more than 300 cactus species and other desert-loving plants, covering four acres of land just outside Las Vegas, Nevada. Every holiday season for the last 24 years, the garden has transformed into a Christmas wonderland. 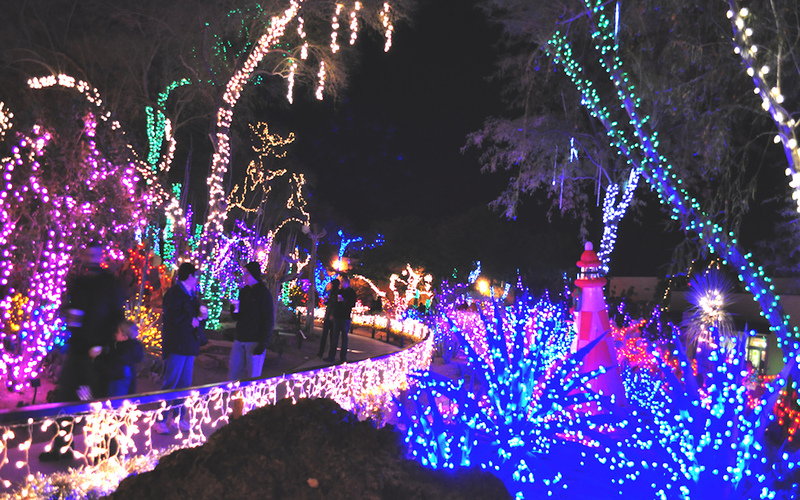 Featuring more than 1 million lights, it’s the largest cactus garden light display in the world. The garden is owned and operated by Vegas-based confectionary company Ethel M Chocolates, meaning visitors can enjoy a hot chocolate to enjoy while strolling the grounds and admiring the colourful cacti (try the spirit-infused hot chocolate for some extra warmth). Guests can also take a tour of the on site chocolate kitchen, or skate among the succulents at the on-site ice rink for the first time. The Ethel M Botanical Cactus Garden is open to the public every day up until Monday, January 1, 2018. Entry is free. Visit the website for more details. Check out Qantas flights to book your next adventure in Nevada.